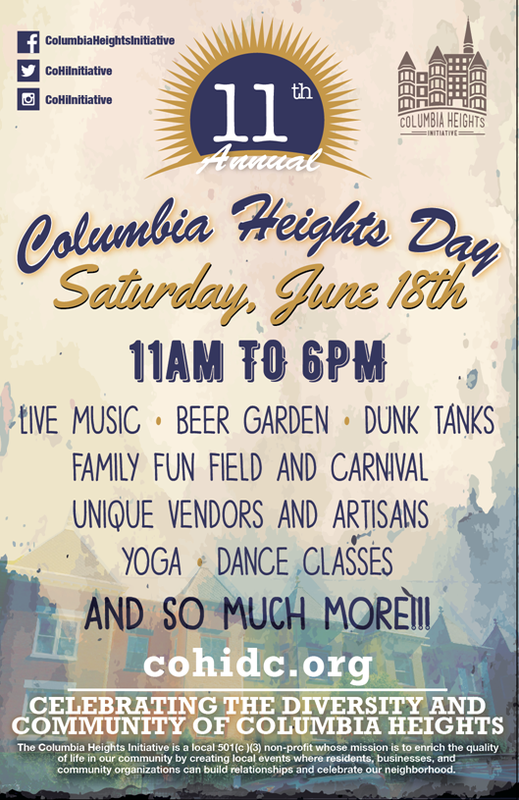 Columbia Heights Day is Saturday, Come Visit Some of Your ANC 1A Reps | Park View, D.C.
Columbia Heights Day is this Saturday from 11 a.m. to 6 p.m. (see flyer below). In addition to the events listed below, ANC 1A will have a booth so feel free to stop by and chat with some of your local ANC reps! We’ll also have copies of both the Columbia Heights and Park View Walking Trail brochures (you can also get copies of the Park View version at Walls of Books). Also, if you’ve ever want to see me in the dunk tank, swing by around 2 p.m. That’s when I’ll in the tank. This entry was posted on June 16, 2016 at 7:01 am and is filed under Celebrations, Sports leisure and entertainment. You can subscribe via RSS 2.0 feed to this post's comments.